72 backers pledged $3,419 to help bring this project to life. Earthdawn RPG has a rich setting, one that gives a lot of the common tropes of fantasy adventure gaming a reason to exist. It mixes the familiar with the exotic; dwarves, elves, and humans mingle with the lizard-like t’skrang, the earth-skinned obsidimen, and the small, flighty windlings. This KickStarter will bring all of these varied races along with unique monsters for them to face to improve your experience playing the RPG. Since several of the races in Earthdawn are unique in fantasy RPGs, this project will be an opportunity to have miniatures cast that match better with your characters while playing Earthdawn. 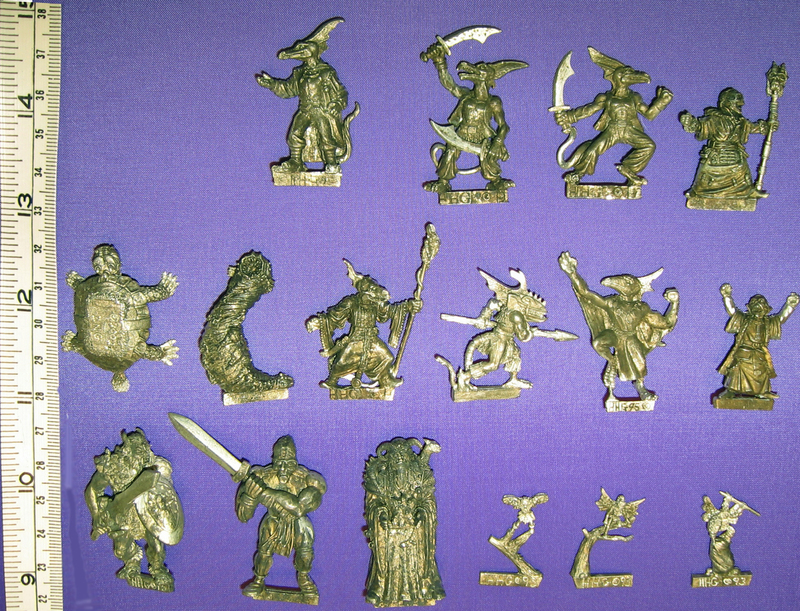 FASA has granted us permission to bring this line of miniatures into production to go with the Earthdawn RPG. Recently Impact! obtained the masters for the miniatures of ZN Games which held the masters for the Heartbreaker Hobby Earthdawn range so we can have new molds made for the miniatures from the original masters. The miniatures are provided unpainted in spincast resin. The miniatures might require light clean up and some assembly (although we did our best to keep the figures with as few pieces as possible). The miniatures are 28mm scale. Rather than force our backers to take a specific set of miniatures that might have some they desire and some they do not. The different reward levels give you a number of points to spend on the figurines. You select a reward with the number of points that you desire and then when you complete the pledge manager you will be able to select exactly the miniatures you want and only the miniatures you want to spend your money on (so you get the most bang for your reward dollars). You will pick your specific miniatures through a pledge manager sent to you about one month after the KickStarter ends. Here is the list of all the miniatures currently unlocked for this KickStarter and the point cost of each one. The following image will allow you to see the size of the miniatures compared to each other and a ruler. At $3,600 we will unlock the Obsidiman Wizard and add it to the list of miniatures you can use your points to obtain. The Wizard will be 5 points. Every $10000 up through $50000, we will add more free points to all the reward levels that say they received free points with stretch goals. Special Thanks to Dan Scheppard, Rob Jedi, Jesse Skoubo and Lost Mini Wiki for images to assist with the KickStarter! Chris Adkerson and Tom Anders are the owners of Impact! Chris is a logistical and product development partner and Tom handles all the nuts and bolts to make the company run (web development, taxes, bookkeeping, inventory, shipping, etc.) since 2006. You may see comments from either of them from the Impact! account. FASA Corporation owns the Earthdawn RPG. Ross at FASA has been incredible to work with on this project. The name Earthdawn and the Earthdawn logo, the names Obsidiman and T'Skarr are all property of FASA Corporation and are used with permission. No contest of rights for these names are images is intended by this KickStarter. There is one major way that KickStarters are successful: Social Media. If you want to help us fund and then hit all these stretch goals, please take a few moments to share the project on Facebook, send out a tweet on Twitter, mention the project on Reddit or start a thread on your favorite forum to discuss the project. Let the people know we are here so the project can be as successful as po, ssible. Finally, thank you in advance for backing and helping support our project! Tom and Chris @ Impact! http://kickingitforward.org Impact! believe in supporting the KickStarter community and will donate 5% of any profits made on this KickStarter to other KickStarter projects. In addition and more importantly, FASA has agreed to donate its licensing fee for the product from this KickStarter (and future sales) to the Chris Bledsoe Pay-It-Forward Memorial Fund ( https://www.facebook.com/profile.php?id=100007944226764 ) which is used to help support miniature based games trying to fund on KickStarter. I want to thank Ross at FASA for this extremely generous offer. Specs: The resin we use for our castings is a hard (75D) heat resistant plastic resin. It is much harder, and tougher, than normal resin. This resin can withstand 320F, and can handle prolonged exposure at 150F with ease (so our Australian friends should not have any problems during the summer). It can be super-glued together, and takes standard miniature paints easily (we recommend you wash the figures first with a degreaser soap (Dawn or Dasty) to remove any mold release agent that might still be on the miniature.) Our painters also recommend Krylon spray primer works great to prime the figures if you want a recommendation for primer. Safety: The resin we use is very safe ... so why you ask do we include a safety section to our KickStarter? We had a person buy one of our figures and stick it into direct flame over his kitchen stove to "soften" it so he could modify it. As would be expected with any item you stick into flame ... it caught fire ... which resulted in him reporting the product to the United States Consumer Product Safety Commission and us promising that on all future sales we would make sure we tell our customers to please not light their toys on fire. So here goes: Our resin figures should never be exposed to direct flame. Other than this, our figures have no special safety precautions, the dust is non- carcinogenic. However: all material dusts will irritate the lining of the lungs, and make existing conditions worse, so we recommend wearing a dust mask. Better safe than sorry! The resin is safe to expose to INDIRECT heat. Unlike many plastics (PVC etc.) it does not give off toxic vapors. Heating the resin to 320F from indirect heat is safe, and a good way to soften the material in order to re-position parts (then plunge into cold water to set). AGAIN DO NOT EXPOSE OUR RESIN FIGURES TO AN OPEN FLAME. Heck... don't expose any resin or plastic toy from any company to direct flame. It is just a REALLY bad idea okay. The largest challenges have already been overcome. We have the finished masters for the sculptures for the project. The only remaining obstacle would be something disastrous happening to our resin caster, which would require finding a new caster. However, given our multi-year working relationship, that should be in the long odds category. Given that we already successfully handled 5 resin miniatures projects (over 200 new figurines) we have learned the most important lessons we needed to ensure this project is a success. Also our previous 3 completed miniatures KickStarter delivered on time (Fantasy Football Ogres) and 2 months early (Asian Chibi and Gaslight Chibi), we are confident in our ability to deliver this project. 1) New dice suitable for use with Dungeon Crawl Classics. Dice should arrive mid-December and all rewards should be shipped out by end of January. 2) Fantasy Football miniatures. Currently being shipped and should be completed by the end of November. 3) Pony Chibi miniatures. Currently being molded and should be completely shipped out by end of January. 4) ZN Games miniatures. Currently being molded and should be completely shipped out by end of January. So all of these projects are in motion and should be fully shipped out before these figures should be ready for shipping so there should be no problems with timing due to our other projects. A thank you from Impact! for your support of the project. All help is much appreciated. ADVENTURER LEVEL - You receive 5 point to use to select from the list of available miniatures for the project. You may add points to this level for $1 each. SWORDMASTER LEVEL -You receive 25 points to use to select from the list of available miniatures for the project. Starting at $10,000, Stretch Goals will increase the number of points you get with this level. You may add points to this level for $1 each. MAGE LEVEL -You receive 50 points to use to select from the list of available miniatures for the project. Starting at $10,000, Stretch Goals will increase the number of points you get with this level. You may add points to this level for $1 each. SHADOWMANT LEVEL - You receive 80 points to use to select from the list of available miniatures for the project. Starting at $10,000, Stretch Goals will increase the number of points you get with this level. You may add points to this level for $1 each. NETHERMANCER LEVEL - You receive 110 points to use to select from the list of available miniatures for the project. Starting at $10,000, Stretch Goals will increase the number of points you get with this level. You may add points to this level for $1 each. ILLUSIONIST LEVEL - You receive 170 points to use to select from the list of available miniatures for the project. Starting at $10,000, Stretch Goals will increase the number of points you get with this level. You may add points to this level for $1 each. OBSIDIMAN LEVEL - You receive 230 points to use to select from the list of available miniatures for the project. Starting at $10,000, Stretch Goals will increase the number of points you get with this level. You may add points to this level for $1 each. GAMEMASTER LEVEL - You receive 290 points to use to select from the list of available miniatures for the project. Starting at $10,000, Stretch Goals will increase the number of points you get with this level. You may add 5 points to this level for $3 per 5 points or 1 point for $1.